If you’ve been thinking about starting a business for a while now, you’ve likely come up with some reasons on why you can’t do it right now. Being scared to start a business is perfectly justified. Being a successful entrepreneur is hard and if you want to be a success, you have to go all in. That means taking a leap of faith and trusting that everything will work out. Below are some of the most common excuses we hear from people on why they can’t start a business. Are these excuses holding you back from living the life you want to live? We hear the time excuse a lot. The reality is this: everyone has the same 24 hours in a day. We’re all busy, but you find time for the things that are most important. If your business is something you really care about, you’ll make time. Once you get started, you’ll start to prioritize things that maybe you didn’t in the past. You’ll get better with time management and scheduling and will learn how to balance your work with your life. The money excuse is another big one. Of course, there will be expenses to get started. Depending on the type of business, those costs will be different, but our biggest advice is to use what you have. Start small and work your way up. For example. when we first got started, we didn’t have a big budget for advertising. We designed a simple business card and used a Vistaprint promo code to print up 250 cards for cheap. We used social media to generate buzz and we started blogging regularly to help with SEO. We got creative and didn’t let money get in the way. Think you don’t have enough skills to start a business. Guess what? You can learn. Nobody starts out as an expert. There are plenty of ways to learn and improve on the skills you do have. Just because you might not be as experienced as someone else doesn’t mean you can’t provide value. Just because others are doing it doesn’t mean you can’t as well. The key is to figure out what makes you different from your competitors and find your niche in the market. When we first moved to Philadelphia, we were faced with a lot of competition. Instead of worrying that we were never going to be able to compete with these established companies, we starting focusing on doing the things that they weren’t doing. This made us different and helped us stand out. Now, when you search for web or branding companies in the area, we’re right up there with our competitors. Another thing to add to this point- consider collaborating with your competitors. We truly believe that there is room for everyone to succeed and by working together, you may come up with a creative idea that is beneficial to everyone. A lot of people think they need a fancy office or tons of fancy equipment to be a legitimate business. Not true! Again, this goes back to using what you have. When we first started our business, we did everything out of our 575 sq. ft. apartment. Our “office” was a computer on top of a cheap Ikea table next to the kitchen. Over the years, we’ve grown and expanded, but we still strongly believe that you don’t need a bunch of fancy tools to run a business. Use what you do have and expand with time. I’m not qualified to do this! Guess what? The qualifications of someone else have nothing to do with you. There are plenty of people that can benefit from the knowledge that you do have and over time, you’ll get better. As an entrepreneur, you will be constantly learning new things. Don’t let your fear of not knowing everything stand in the way of getting started. Marketing is another thing that you will learn as you go. With time, you’ll get more comfortable with the idea of promotion and marketing will be a lot less scary. You’ll figure out what works for you find creative ways to share your message. And as your business grows, you’ll have the opportunity to outsource that work to someone that is good at it. Failure may be the biggest excuse holding you back from starting a business. Even though we are several years into running a business, we think about failure often. It’s natural to be worried about failure, so we suspect most business owners (even wildly successful ones!) think the same thing. The truth is, you will fail at things! Every business owner makes mistakes, but failure doesn’t have to be bad. Use your failures as opportunities to learn and grow your business. Your business won’t grow unless you change, so use your mistakes as fuel to propel your business further. 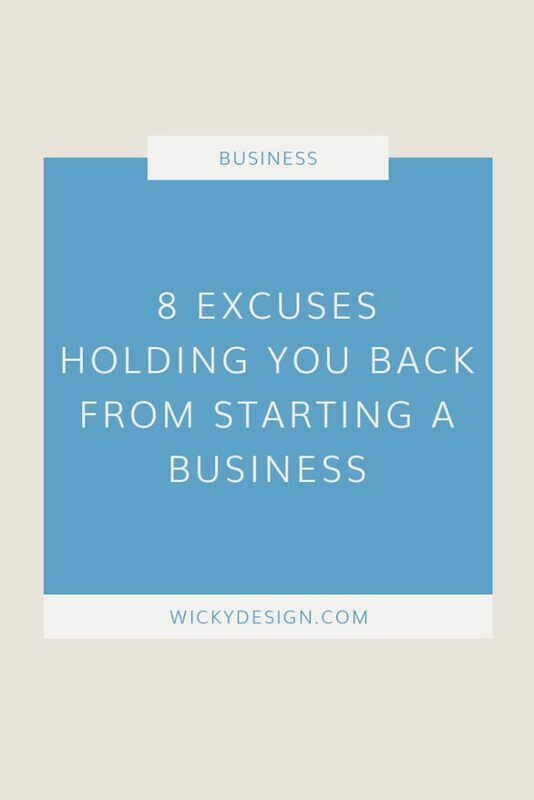 Don’t let these excuses hold you back from starting your business and creating your dream life! Ready to quit your 9-5 and make the leap into entrepreneurship? We’d love to hear your story and see if we can help. Sign up today for your free 15-minute consultation call.